It will be addressed directly to the customer, and give them the correct address for the specific FTP site that was created for them, along with their log-in user name (which is their e-mail address) and a randomly generated password. One thing to note is that the password is case sensitive, so I recommend doing a copy/paste from the e-mail to avoid typing errors. 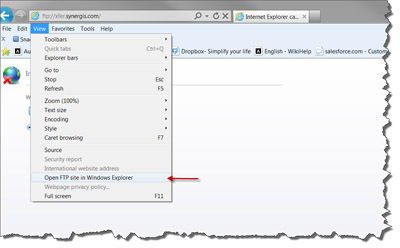 Either way, you will bring up a typical Windows explorer dialog box with another small dialog box in front of it to enter a user name and password. Again, I recommend coping and pasting the information directly from the e-mail, as the password is case sensitive. 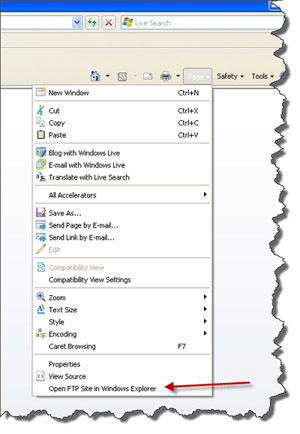 After entering the your log-in info the window will look like a typical window you would see if you were using windows explorer to navigate your local PC except for two things. 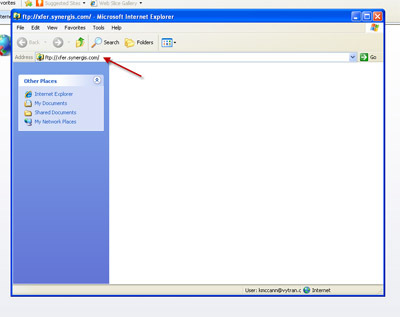 IN the address bar you’ll see the FTP site address and not the usual C:\, and also the folder will be empty. The time for the files to copy over can vary from several minutes to a couple hours depending on the size of the data set. But when it’s completed you should see the typical dialog telling you the copy process has completed. In some cases however some customers might have issues accessing the FTP site due to their company’s security policies. In those cases I would recommend contacting your IT department and see if they can temporally grant you permissions to access to the FTP site, or possibly upload the files for you so they know there are no security issues. I’ve had cases where by company policy customers are using a web browser other than internet explorer and experience issues with logging into the FTP site. In those cases I recommend using a stand-alone FTP client to access the FTP site rather than your web browser. Since there are so many of these applications it would be impossible to cover all the specifics of them all. However the main thing to remember is that when using them is that where it asks for the “Host”, you should enter the address of the FTP site, the “Username” would be the username you were given in the original e-mail, and the “Password” is the password from the original e-mail as well. If there is an area to specify a “Port”, there is no need to enter anything in. Out FTP site does not require a specific port to be accessed. 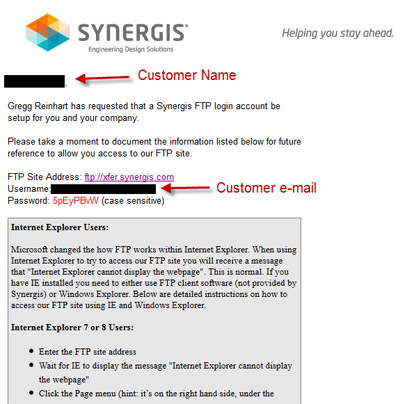 Hopefully this will clear up the process of using the Synergis FTP site, and make your helpdesk experience smooth and convenient. Gregg Reinhart comes to Synergis with a B.S. in Ceramic Science and Engineering. He previously worked at F.L. Smidth as a Mechanical Designer. Gregg has expertise with AutoCAD, AutoCAD Mechanical, and Inventor as well as many other Autodesk solutions. Check out Gregg’s Linked In for more info.